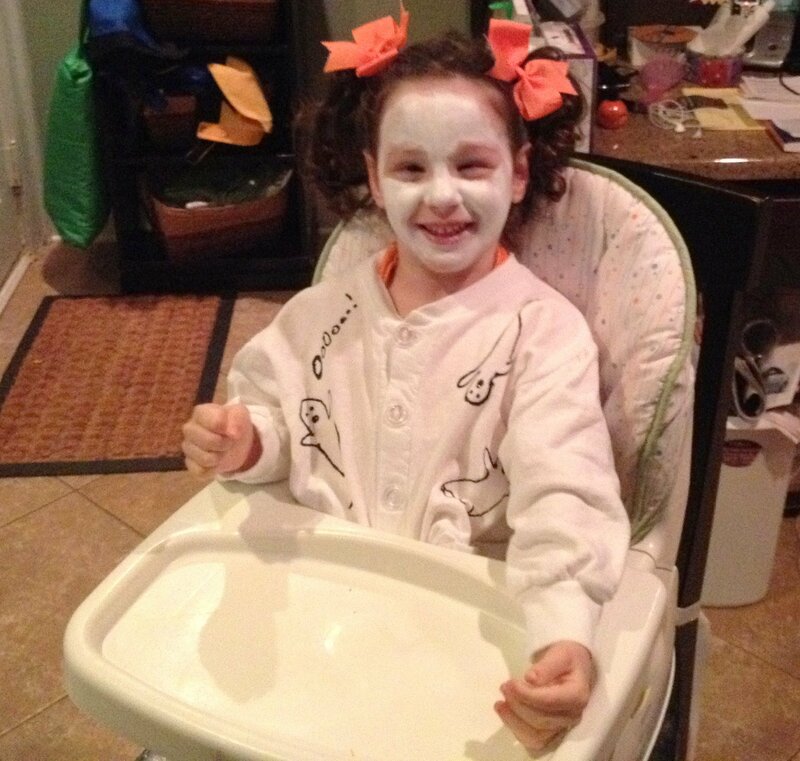 I want to give Maya every opportunity to feel like other children in a variety of settings. This past weekend we took her to the movies and tried out her new Special Tomato Booster Chair. She was so happy to be able to sit in the theatre seats like everyone else. Coincidentally, the next day a friend of mine, whose daughter uses a wheelchair, posted a picture on Facebook of her child sitting at the table with her family for the first time. Her child is three years old. She said to me, “I know it seems like such a small thing but she has never been tall enough to reach the table and eat with the rest of us”. I didn’t think it was a small milestone at all. In fact, I knew exactly how she felt. From the time Maya was very young we have struggled to find the best ways to support her in a seated position. Because we are an active family and we enjoy being on the go, we are always searching for equipment and creative solutions that are versatile, easily transported, supportive, and maximally inclusive. 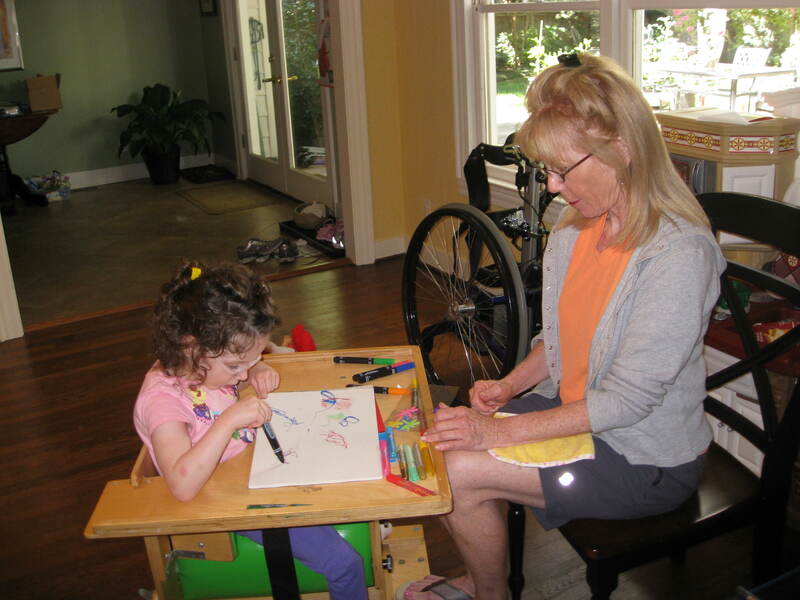 Maya is now five years old and it was only this year that she has been able to fluidly get into sitting and interact with her environment with any degree of independence. Still, we rely heavily on adaptive equipment for sitting due to her continued balance challenges. We have used a variety of mainstream market products and adaptive seating options along the way. I have wondered how other parents tackle these sitting challenges and I hope that by providing insight into our journey and the list of products we have tried, we can help others get through similar issues. *There is a summary list at the end of this post with brief comments about seating products we have tried. Maya showed signs of sitting independently within the first year but she lacked the stability to maintain it, and she could not get into a sitting position on her own. I remember a couple of physicians and therapists evaluating her early on and remarking how “she sits so well”. Their evaluations were shortsighted because they considered her sitting successful if she could hold the position for a few seconds. Unfortunately, even a subtle noise was enough for her to lose her balance and fall over. She was quite adept at performing for doctors and therapists for short assessments, but she couldn’t play meaningfully with toys or other children. Over the last few years, I have repeatedly said, “If only Maya could sit up by herself I could do so much more with her and she would be much more independent.” Instead, I have often struggled to support her in a sitting position while simultaneously trying to help her engage with her environment. This discrepancy between her performance for her doctors and her lack of independent sitting at home has made for a confusing journey. 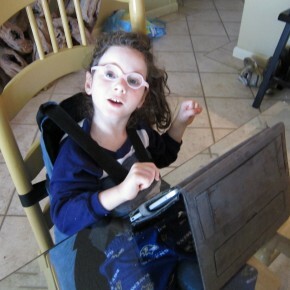 Since we were told early on that her case of CP was mild (which turned out to be incorrect), we kept prolonging the use of mainstream items thinking she would soon be on her way to independent sitting and mobility. Instead, we have slowly been pulled into the world of adaptive equipment. Until she was about three years old, Maya used mostly conventional baby/toddler items for sitting. 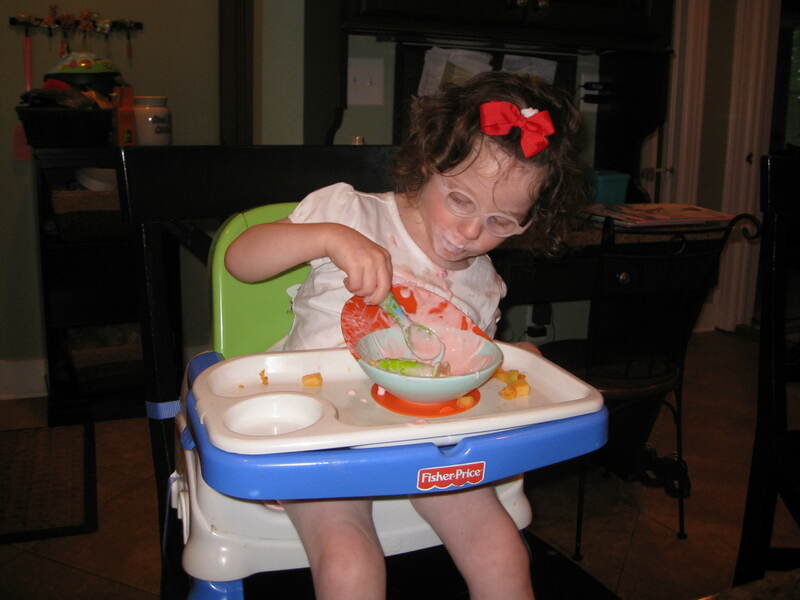 We were able to find mainstream market toddler booster chairs and make small adaptations to them so that they worked for her. However, there came a time when the rolled up towels and tweaks stopped working. This was true even for some of our adaptive items. I have learned my lesson about trying to make ill-fitting mainstream items and adaptive equipment work. When a product’s foundation fundamentally does not provide appropriate support for Maya, attempts to improve it with more straps or additional accessories are fruitless. Sometimes we use Maya’s wheelchair for sitting but it often prevents her from interacting at the same level as her peers and with adults. For some children, the wheelchair may be the best and only option because of the nature or presentation of his/her disability. Since Maya has good head and neck control (and some trunk control), I do whatever I can to offer her alternative seating opportunities. When she is at home she rarely uses her wheelchair since we want Maya to practice moving herself without equipment whenever she can. When she gets older this may change. For the time being, I feel it is important to vary her seating options whenever possible to include her as intimately as possible with the people around her. Once we started accepting the realization that we needed multiple pieces of better fitting equipment, over time we learned that finding appropriate equipment for Maya was not easy. It requires patience, research, intuition, trial and error (it is helpful to borrow equipment from lending agencies or therapy groups), the assistance of experienced therapists and vendors, and sometimes a little serendipidy. As I have learned more about how Maya’s CP affects her body I have found that I have a sense of what equipment may work for her. I have often presented ideas and specific products to Maya’s therapists for their approval and input, and this team approach has been successful for us. There are many variables to consider when determining what type of seating solutions will work for your child. Because CP presents in countless ways, not all equipment will fit every child. At the same time, we are often faced with having to pick from the same equipment bases but use different accessories to personalize it for our unique children. Consult with your child’s therapist to help you determine which areas your child needs additional support. Then make a list of what you feel is important for your child and yourself in using the equipment. What do you feel is most important for your child do be able to do during these activities? How do your child’s therapists feel these goals could be achieved with equipment? What do the therapists feel is important for your child to be able to do or practice during these activities? Where will your child participate in these activities? How will this affect your needs (i.e. do you need something portable or lightweight)? If your child is able to provide input, ask them what he/she wants or needs. You may be surprised by her answers. Once you have identified a potential piece of equipment for your child, consider how often and for how long it will be used. Some items we have seen (or that have been presented to us) have seemed like a great idea but when applied to our situation we found it was wise to look for more practical and less expensive alternatives or solutions. For instance, a floor sitter with a tray may seem like a fantastic idea but perhaps your child doesn’t like to sit still and will spend her time fighting to get out of it. If the item you are considering is $50.00 you may be willing to take your chances without much thought, but if it is $500.o0 you will probably have some regrets if it doesn’t get used the way you had hoped. It may help to select multi-use items to address issues such as this where you know the equipment will definitely get used for one activity and then if it gets used in an alternate but much less frequent way, it will be a bonus rather than a regret. Or, perhaps after considering an item you do conclude that your child needs it. You may determine that your child may not need a particular piece of equipment for very long, but that it is essential for the time that she does need it. And my final suggestion…Do not buy it unless you are able to try it (or return it once you do try it)! Ideally your child should be appropriately supported in sitting so she has free use of her hands and arms (rather than putting all of her energy into keeping herself upright). This can be difficult. Often we have found that equipment is either too restrictive or not supportive enough. Some pieces of equipment can greatly limit a child’s interaction with her environment. For instance, I love how Maya is able to use her hands and arms in the Kaye Bolster Chair. I also appreciate that it has wheels and I can move it throughout the house. It has a large tray table that is great for crafts, painting, and eating. The downside is that the tray creates a large boundary around her that prevents her from moving about her environment or getting close to peers, and obviously using the same workspace. There are trade-offs with using any piece of equipment but you want to at least be aware of what you and/or your child may be giving up in using a particular product. Our most recent search for a new product for Maya came about a few months ago when she outgrew her mainstream booster chair by First Years. It was our last hurrah for using a conventional seating option for eating. She had simply gotten too big to use it and I no longer had any luck finding a mainstream item to replace it. We have an island in our kitchen with bar stools and I was determined to find a way for Maya to sit there with our family since it is a fun and often used part of our home. The primary issue was finding something that was appropriately supportive and would attach to our bar chairs. Our list of goals in order of priority included good trunk support for effective and free use of hands and arms, ease of use, durability, washability, and lastly portability throughout the house. After looking at the Special Tomato products online for a few years, I decided to finally give one a try for our kitchen. Their Soft-Touch Sitter appeared versatile. 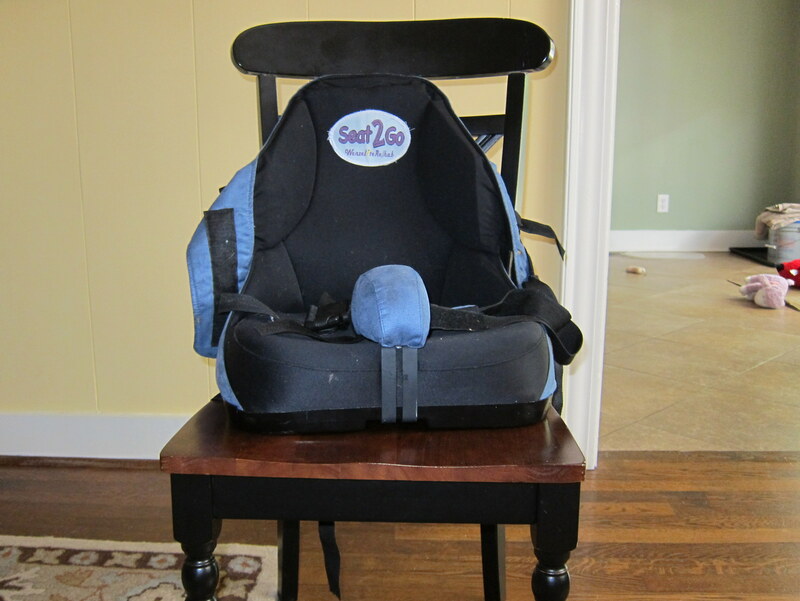 It could be used on multiple chairs, at home and potentially at school, and the website showed a kit that could be ordered to use the Sitter on the floor. The Special Tomato products are made with a material that is easy to clean, soft and cushiony. It has some give while being molded and this appears to be a great combination especially with Maya’s shifting muscle tone. I ordered the Sitter and, except for lacking a removable tray, the product has not disappointed. We had such a good fit with the Sitter, I decided to order the new Special Tomato Booster Seat to use when we go to restaurants and for traveling. This was an area for which we currently did not have an alternative to using Maya’s wheelchair after she outgrew the Fisher Price Healthy Care Booster Seat. We were not sure if the Special Tomato Booster would be supportive enough. It turned out it wasn’t, and I went ahead and ordered their Soft-Touch Back Cushion Liner (The back and seat liner products can be used to increase support in strollers and wheelchairs). 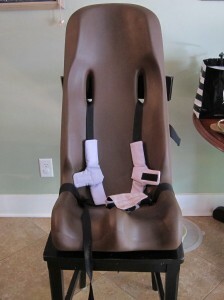 The Back Liner is presented on the website with a Seat Liner that is similar to the booster seat but with a lower profile. The combination of the Special Tomato Booster Seat and Back Cushion Liner work great and offer Maya the additional support she needs. All we need now is a bag to carry it together. Before we used the Special Tomato products, we had tried a list of items that never worked as well. 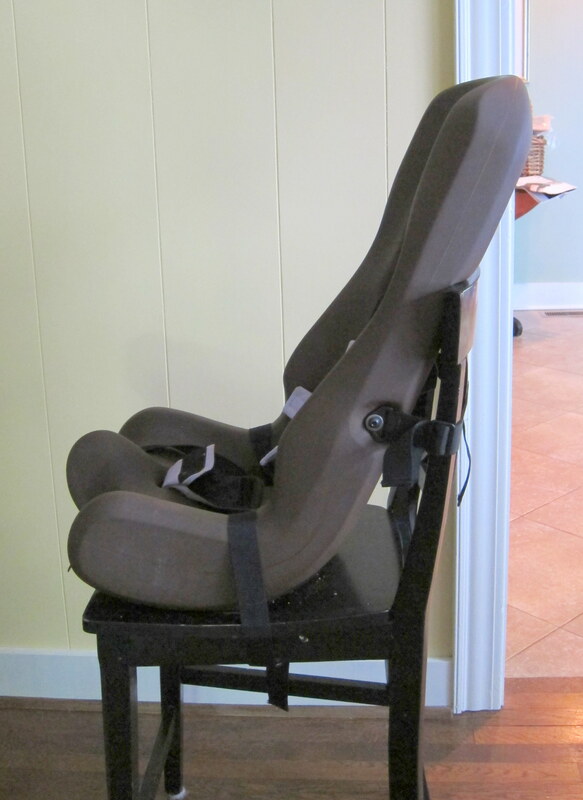 The Seat2Go by Drive Medical was the piece of equipment we used heavily outside of our home, at pre-school, and for travel for a couple of years. Conceptually it was ideal but it never independently provided the trunk support Maya needed, and it had a few other problems. It was a stepping-stone and one I was grateful to have. It gave us ideas about what we were looking for and what Maya needed in an adaptive seating product. We used to put towels on the sides of it and often readjusted her when she used it. You may find that it will work well for your child. In fact, Maya used it at school for the last couple of years inside of a Rifton chair like this one. Even though it wasn’t perfect, I felt the Seat2Go had so much potential that I contacted the product developer with a list of potential improvements for it. These included increasing lateral adjustability, using a material that is easier to clean (it is a suede/velour type of material on much of the outside) and changing the bottom so that it doesn’t scratch the surface of what it is sitting upon. My biggest design issue with this product is that it is called the Seat2Go but it is not easily carried. When transporting it the straps hang all over the place, there is no handle or backpack straps for carrying it, and it could use its own storage bag. I have wondered why we have struggled to find the right products for Maya. We often seem to fall in the middle of what manufacturers offer. Are her supportive needs different than most of the other children using equipment? Are the product developers’ surveys not yielding complete information about what special needs consumers and their families are looking for? Perhaps it is the difficulty associated with companies trying to maintain profits by trying to create universal products and in the case of CP, apply them to non-universal problems. I would like to see manufacturers offer more intimate communication with special needs families and more specific customization options. One company called Prime Engineering (makers of the KidWalk Gait Trainer) offers customization beyond their standard list of accessories and encourages the consumer to contact them. I am also not sure why there are not more simple (and in turn less expensive) adaptations available for conventional products, or why the special needs market seems to often be out of touch with our family. Frequently it seems that the accessory or adaptation we need is not found among the list of product options. Although products have improved over time in terms of materials, convenience and portability, I still feel special needs manufacturers could do better. Perhaps because the person who founded Special Tomato has a grandchild with Down syndrome, he understands the needs and goals of children with disabilities and their families better than most. Fortunately, it looks like we have found a company whose products for sitting work well for Maya and address our concerns as well. Special Tomato Soft-Touch Booster Seat-Portable, lightweight, easy to clean, good combination of material that gives and is molded for support, can be used in multiple settings and can be adjusted for use on different chairs. Special Tomato Soft-Touch Back and Seat Liners-Portable, multi-use (in strollers, wheelchairs, on desk and table chairs), lightweight, easy to clean, easy to transport. We ordered our Convaid push wheelchair a couple of years ago. Our priorities were different at the time and ease of use, portability, and a mostly upright configuration were our highest priorities. It has never offered Maya the support she needs. I love how light it is and it is very convenient. We tried the Special Tomato Booster on the base and it appeared to resolve most of Maya’s issues except the Booster is a bit too high. I am going to order The Soft Touch Seat Liner for use with this wheelchair in hopes of resolving many of her support issues. Special Tomato Soft-Touch Sitter-This is a countered seat that offers a five-point harness for support around the chest, pelvic area and waist (we don’t use the chest/shoulder straps). It has a built in abductor and head and lateral supports. Although it is tall, it is lightweight and can be used in different chairs at home and perhaps at school. I wish it had a removable tray. This is not the most convenient item to transport but it has lots of versatility. 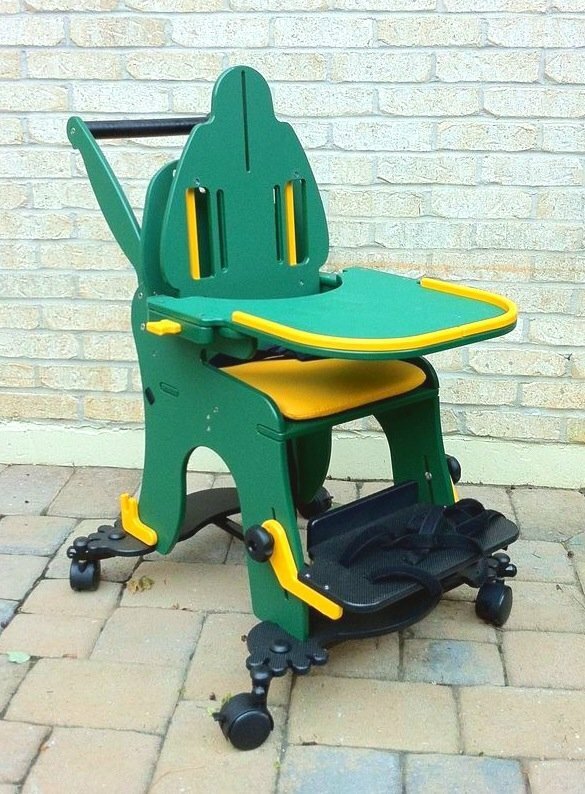 There is an option for a stable or mobile floor kit, it can be turned into a tilt-in-space chair, and it is offered in child through adult sizes. Why did we wait so long to try this?! Seat2Go-We used this piece of equipment frequently outside of our home, at pre-school, and for travel for a couple of years. Conceptually it was ideal but it never independently provided the trunk support Maya needed, and it had a few other problems. It was a stepping-stone and one I was grateful to have. It gave us ideas about what we were looking for and what Maya needed in an adaptive seating product. We used to put towels on the sides of it and often readjusted her when she used it. You may find that it will work well for your child. In fact, Maya used it at school for the last couple of years inside of a Rifton chair like this one. Even though it wasn’t perfect, I felt the Seat 2 Go had so much potential that I contacted the product developer with a list of potential improvements for it. These included increasing lateral adjustability, using a material that is easier to clean (it is a suede/velour type of material on much of the outside) and changing the bottom so that it doesn’t scratch the surface of what it is sitting upon. My biggest design issue with this product is that it is called the Seat 2 Go but it is not easily carried. When transporting it the straps hang all over the place, there is no handle or backpack straps for carrying it, and it could use its own storage bag. The pictures below have the pommel accessory which is an option, but does not come standard with the Seat2Go. Kaye Bolster Chair-This has been a great option for Maya at home and at school but again it creates a large boundary around her. The company’s website states, “that it was designed for kids who needs a wide based of support in order to achieve good pelvic position, lower extremity position, and trunk alignment for stable sitting.” It comes in two sizes and has an option for moveable casters. Maya’s posture and positioning are better in this chair than any other chair we have tried. Guess who was the first person to use it with her? Her school teacher!! You never know who might have a great idea. 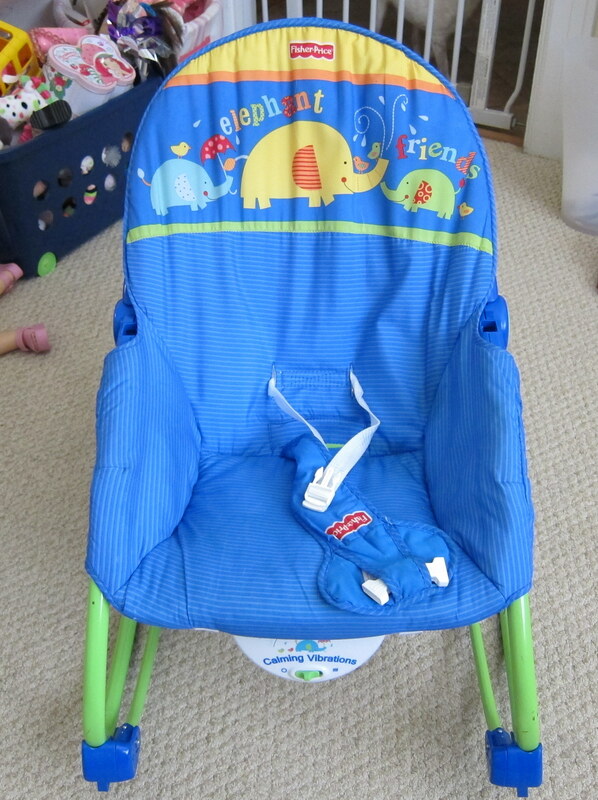 Fisher Price Healthy Care Deluxe Booster-We relied upon this seat heavily at home when we were on the go, at restaurants, and at her grandparent’s house. It is inexpensive, lightweight, and has a carry strap. It is easy to clean, offers three height adjustments, attaches to different chairs, and has a three–point harness, built-in abductor, and removable tray. First Years Learning Curve Reclining 4-Stage Feeding Chair-We started using this when Maya outgrew the Fisher Price Booster chair. It was great and inexpensive. 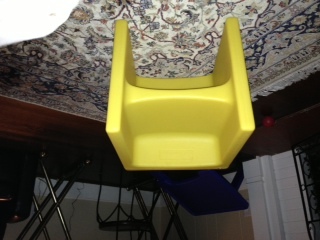 It’s not portable like the Fisher Price Booster chair, but it acted as our primary eating chair at home for a while. It reclines, has a three-point harness, removable tray, built in abductor and offers two height adjustments. 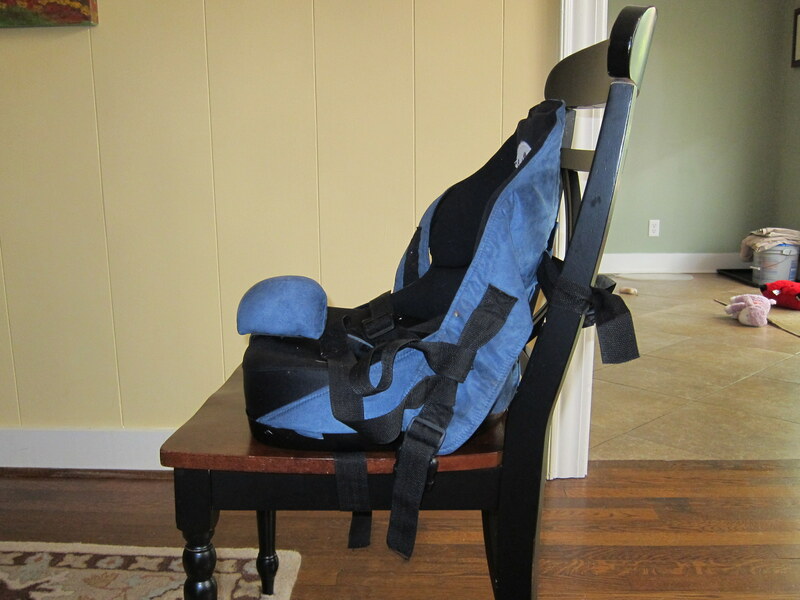 First Years makes an “on the go” chair that may work for your child. It looks like the old style Seat 2 Go. Here is the link to it. 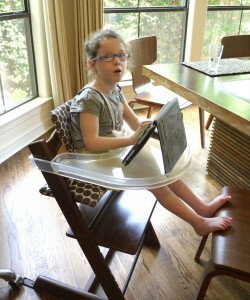 Stokke Tripp Trapp Chair-This was a surprise option that we found at our friend’s house recently. 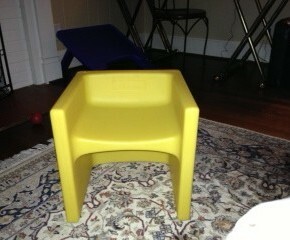 This is the chair they use for their toddler (who does not have special needs). I thought there was no way it would be appropriate for Maya. Surprisingly it was and we were baffled by why it did work so well and better than the Seat 2 Go that we brought with us for her to use. We didn’t order it for our home because we wanted an adaptation that could be added to our existing chairs. It may be worth trying one out with your child. In fact, Special Tomato makes a chair that looks similar but I never thought it would be work for Maya until we tried the Stokke. Fisher Price Infant to Toddler Rocker-We began using this in our living room when Maya was very young until she outgrew it. It was a wonderful option for her to use in front of the TV or as an alternative to lying on her back. Chill Out Chair–We have never tried this chair. I heard about it from another parent on a CP forum. There are two styles a Rock’er and a Roll’er (which is on wheels), three sizes, many color choices, and both include an ottoman which can be used as a side table. The company’s website states that its V-shape design promotes support for the user instead of belts/restraints. They also say it is lightweight and easily transported. Since it is currently a unique offering on the special needs market I wanted to present it here as an option. It is expensive and likely not covered by insurance, but the few parents who had commented on having one (on the forum) or trying it out, said it was awesome. 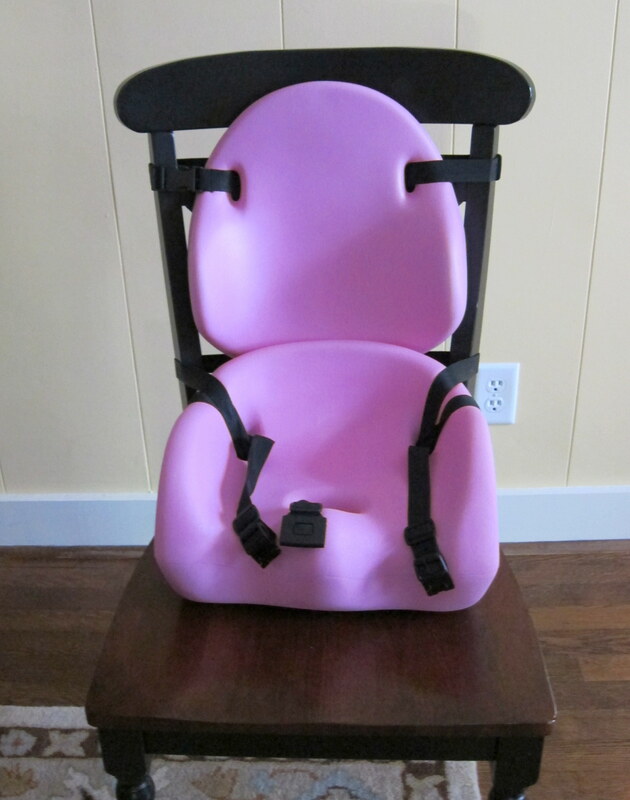 If you have this chair or know someone who does, please give us your feedback to help other families. ***Update-We have received more than four responses about the Chill Out Chair all which have been rave reviews. I received a catalogue on 7.17.2012 which had a new item called the “Cozy Chair and Ottoman Set” by the children’s factory. It looks similar to the Chill Out Chair but is not exactly the same. It does not have an option for wheels or other accessories that the Chill Out Chair offers and it is limited to children age 2-6. It may work for your child though, and if it does, you will have saved a lot of money! Lady Bug Corner Chair-We used this at school when Maya was under three years old. I remember really liking it but I don’t recall a lot of the specifics of what worked for her. I know it was used at her therapeutic pre-school during speech therapy. Platypus Activity Chair-This is a great product, and Maya’s grandparents have it for her to use, but we opted for the Kaye Bolster chair at home because her pelvis kept sliding forward in it. 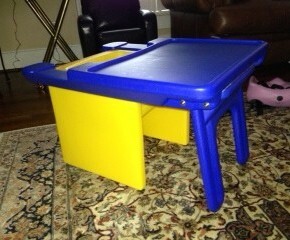 It has many options for use at home and school and has a removable tray and an option for wheels. The chair is by Snug Seat and I like this company because of the whimsy they have brought to adaptive equipment. They use appealing names, fun colors, and we have found several products for Maya (not for sitting) that have worked well for her. The Wombat HighLow Positioning Chair– The Wombat Highlow Positioning Chair by Snug Seat, has a hydraulic lift/lower mechanism. This was the first characteristic of the chair that I was drawn to exploring because I saw it as a possibility for use in multiple places within our home. We tried this piece of equipment when Maya was about 2.5 years old and she was afraid of the hydraulic noise (she had a strong startle reflex at this age). It was also too heavy and expensive, and I found it intimidating to adjust. I like to try and purchase items we can use beyond our home and this one is not made for easy transport. If it were less expensive and if she had not been afraid of the noise, we may have ordered it. Since we didn’t know how long Maya would need something this supportive we considered other options. I wish all wheelchair users had the option to lower or raise his/her wheelchair to meet a variety of table heights. I have seen a mainstream market high chair that also has a hydraulic mechanism (like you see at the hair salon). It is by Boone. Here is a link to it. I have seen it in person and thought it had a lot of possibility. IT was heavy, but not nearly as heavy as the Wombat. I would have purchased it if Maya were not so close to outgrowing it. If there is a product designer reading this, how about merging some of the characteristics of the Wombat and Boone Highchair? Sometimes I wish the special needs product designers used mainstream products as a guide for new product designs. They are not always so far from what we need. The manufacturer of the Bumbo realized the market demand for their product within the special needs community and created a larger size. I will be honest here and let you know that I am not a fan of floor sitters for very young children. They give kids little (if any) opportunity to bring objects to themselves, which in our case, Maya was able to do even though she could not sit up. 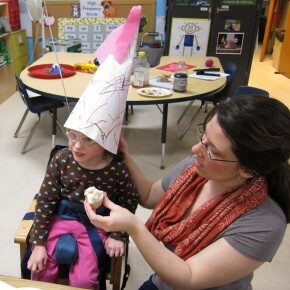 I often preferred having myself or another adult support her in sitting for the brief moments when she did want to interact with her peers or play with a toy, so that she could practice independent moving. It may be a good solution for your child to participate in circle activities (at the library or at school) or for sitting for brief periods of time when interacting with other children or adults. Now that Maya is older, if she was still unable to sit during circle time, a properly fitting floor sitter would be a great way to include her independently with her peers. There is a broad spectrum of costs associated with floor sitters so choose wisely balancing cost, with need, and an appropriate fit. **There has been a voluntary recall of the Bumbo seat (8/12). Since there have been ongoing concerns about the Bumbo’s safety, I feel it is appropriate to remove my review of the Bumbo and its special needs version the Childrite Therapy Chair. There have been no recalls on the Childrite Therapy Chair that I am currently aware of. Rifton Corner Floor Sitter-This is actually one of my favorite companies but this is not one of my favorite products for Maya. This sitter did not support her well and I still have memories of her looking like she was bound to a board rather than having more freedom to use her upper body. Despite the two buckles for the chest and waist (BTW-more buckles do not always mean better support), her pelvis kept sliding forward preventing good use of her hands and arms. It does offer a pommel and this may have helped. It also blocked her peripheral vision which bothered me, but as I have said before, there are trade-offs with all equipment. 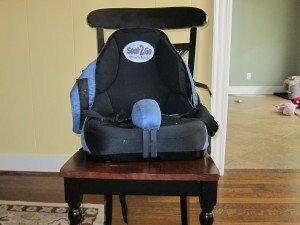 If you are looking for your child to have some independence while sitting, then this could be a good solution. I stopped using it when a child at daycare accidentally knocked Maya over while she was sitting in it. We did not see this happen, and the chair appears very sturdy, so I would not be dissuaded from using it based on this one comment. It is something to keep in mind though when considering how and when it may be used. Perhaps a mainstream daycare program with 2 year olds was not the place to use this product without a personal aid. She could have been knocked over whether she was sitting in the floor sitter or not. At the same time, I think I would have felt better if she was not strapped into a piece of equipment that prevented her from using her body in a natural way to protect herself (something that Maya is able to do well). Special Tomato Soft-Touch Sitter w/Floor Sitter Kit-This item is discussed above (without the kit) and has a kit which allows it to be used on the floor. I love multi-purpose products because they save on room and cost by eliminating the need for another piece of equipment. If you have ever seen Tumbleforms at your child’s therapy center, this is a very similar product. In fact, I believe the founder of Special Tomato used to design Tumbleforms. I do prefer the angled positioning of these types of floor sitters to the more upright sitters for Maya. She typically appears more comfortable in them. 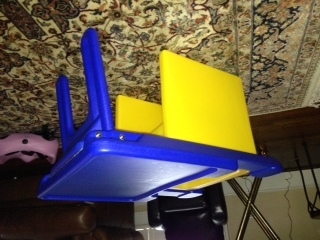 Cube Chair and Edutray-This is not technically a floor sitter but it sits low enough to the ground I thought this was the best place to discuss it. It was a recent find and one we discovered through serendipity when Maya mentioned sitting in a cube chair during a therapy camp. I inquired about it and Maya’s physical therapist showed one to me. We both looked at each other with great doubt. It didn’t look supportive or appropriate for her at all. It can be used on two sides which offer different heights above the ground. We were surprised when we tried it out with her and it wasn’t terrible at all. In fact it had potential. I made some modifications to the base to give her extra support. I was thrilled when I saw that there was an option for a tray! Maya loves it and recently someone suggested trying it for dressing. It has made helping Maya get dressed so much easier since I can sit on the floor and she is close enough to the floor for me to interact with her at her level and save some strain on my back. To view and post user reviews about standers, wheelchairs, and wheelchair cushions, you may wish to visit www.usatechguide.org. What an excellent post! I wish I had read this article when my son was younger–lots of great info. We got my son the AWESOME chill out chair this spring & he loves it. He is 8 and needs lots of trunk support & the chill out chair is perfect for him. Thank you! It can be so challenging to work through these issues. I am so glad to have your feedback on the chill out chair. The only negative I have heard so far from families was the price. It looks like a wonderful possibility and wheelchair alternative for children/teens (maybe older?) who cannot sit comfortably or with enough support, on the family furniture. The most helpful blog I’ve read on sitting positioners!!!!!!!!! THANK YOU SO VERY MUCH!!!! I am so glad you found it helpful Alicia! GR8 N VERY USEFUL STUFF ALL I WANTED .THANK YOU VERY VERY MUCH.GOD BLESS. Wow–I stumbled upon this article by googling supportive floor sitters for toddlers b/c I too believe there is a huge gap in the market place for mainstream equipment but made a little bigger for older toddlers with special needs who benefit just as much as the average child–just a little later in life….hence the term “developmentally delayed”. I too am/ have delayed buying any special needs equipment, one for their price and two, they just don’t fit the bill. I have emailed Fisher Price and Graco! Bumpo was my next. Look there is no perfect 100% piece of equipment. A jumper or exercise saucer made for a taller child, for instance, would be extremely beneficial to some (like my son) who are able to move and jump and stand with the help of these contraptions. PT’s would obviously like time to be limited in such items but if these allow your child some independance and exercise without being tied down to something, with the goal of developing muscles and weight bearing and just having fun. Why oh why are special needs products so limiting!!!! There are so many varying degrees of abilities in children—and most all equipment cater towards the most limiting abilities with a result of limiting the potential of the children who just “outgrow” mainstream products but still need there everyday developmental practicality. I think we need to start a company of our own! The special needs bumbo (Childrite) was worth me finding this article all by itself. I am buying one today! I am so glad you found us and that you found something of use here! It’s so frustrating for exactly the reasons you mention. Would it be great if the big companies offered adaptations to their existing products for a small charge? Or even better, made them a little larger like you suggested! Thankyou for sharing this important info! We also use the first years booster seat. It is funny how she sits better in a inexpensive childrens chair, than an expensive piece of equiptment built for children with low tone. We are having a difficult time finding a wheelchair that isn’t too restrictive, but keeps her safe. 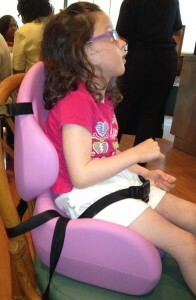 The more restrictive the chair is, the more she fights the supports. With too much upper body support, she will not even hold her head up?!? But she now can sit indian style unassisted for a minute or more. I completely agree with not buying a piece of equiptment without trying it first. We had a nightmare situation in ordering a wheelchair over a year ago. The wheelchair came back three times missing items and finally the chair we ended up with a year later was so heavy I could not lift it. Now I am trying to find a place where we can try a bunch out, because I do not trust the rehab tech’s judgement. Wow, I can’t beleive I stumbled across this article! I have the same cp situation have used almost every peice of equipment -I thought I was the only crazy cp mom out there with an inventive mind with my out of the box ideas, solutions, my whole world was and is adaptation . I would luv to correspond with this mom. 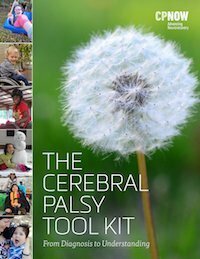 I have a 10 year old son with spastic cp that is very mainstreamed . My e-mall is Hollymcglynn@yahoo.com . My son Justin is on a YouTube video called Krocdoc check it out it ‘s very Inspiring we all need that right. Hello! Contact me through the site any time. It’s just me here. I am an OT and this “real life” test run info is very helpful to me! Thank you! Thank you for such an informative post. I have been trying to find a booster for my son Ayden to take to friends, on trips and restaurants. We do have the tomato high chair but you can’t easily transport it since it doesnt break down. Do you know of any bath chairs that we could use? I am looking for some options. Thank you so much for sharing! Hi Doreen. Thank you for stopping by. I am so glad you found this post helpful. I wanted to clarify that you were looking for bath chairs separately from your restaurant and outing needs? Can’t thank you enough for this thorough review. 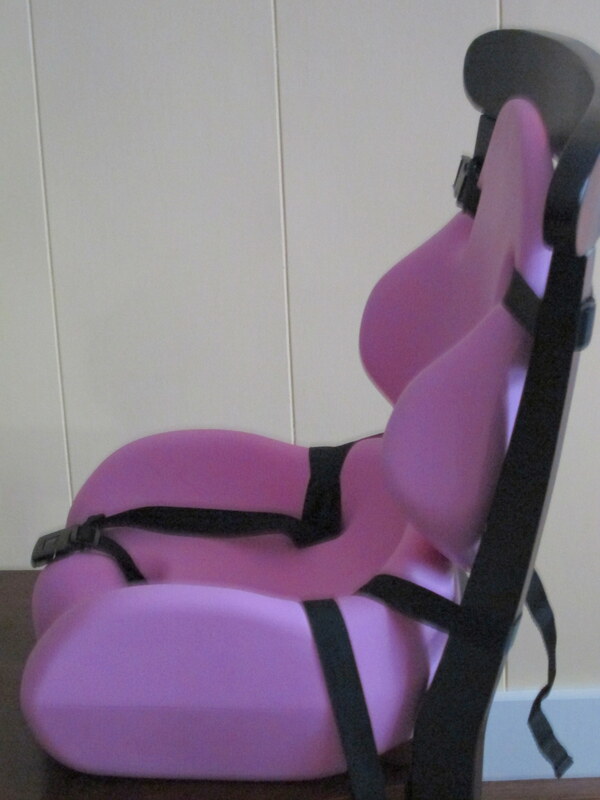 I’ve been feeling completely lost trying to find adaptive seating options for my daughter. Amazing that you’ve laid so many examples out for me to read. I want to thank you for this very thorough and helpful review. Eyes are in search of at least one video which shows that a c.p. child can achieves milestone of a normal child. I am in need of a harness type product that would allow to caryy my spastic cerebral palsy brother teen on my back, similar to the one on the news. I have searched a lot on the Internet and i can not find the producer. Please help me with this. As a student going into occupational therapy I cannot begin to explain how helpful this is! It is so nice to have first hand pros and cons to tell families about! I am so glad to hear that! Thank you for stopping by! My name is Abi, and I’m working with a group of Biomedical Engineers at Georgia Tech to develop a new seating solution for children with disabilities (We have partnered with the SPOON Foundation.) We are currently doing some preliminary research, and we found this post extremely useful. We are trying to get in touch with users of the current seating solutions to figure out exactly which problems parents and children are facing (specifically with feeding.) We are planning to have a more formal survey out for the CP community soon, but we would love any initial feedback. Please comment below or reach out to us at seattoeat@gmail.com. I would be happy to help! I need more information about what exactly you would like for me to provide insight/feedback about. Feel free to contact me directly through email and I can give you my phone number. Thank you, Michele! I emailed you directly. Hi Michele, Thanks so much for this INCREDIBLY helpful review! Did you by chance see or use any of the the firefly friends equipment? Their GoTo seat looks like it could be great for travel but I was wondering if you’d looked into it? http://www.fireflyfriends.com/goto-seat Thanks! Wow….what a great find. 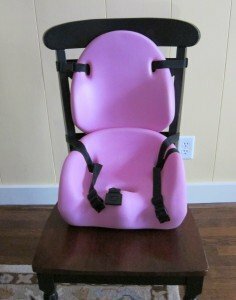 I am looking for other types of seating for my daughter with CP. She is 38 years old, and gets very tired of sitting in her wheelchair. Most of the time she lays on the floor. I am looking for other options to make her comfortable. I am also looking for any other suggestions for therapy. I recently was investigating the vibration machines. We live in an area that does not have a lot of support for her. I would love to converse with other parents about this. Thanks!